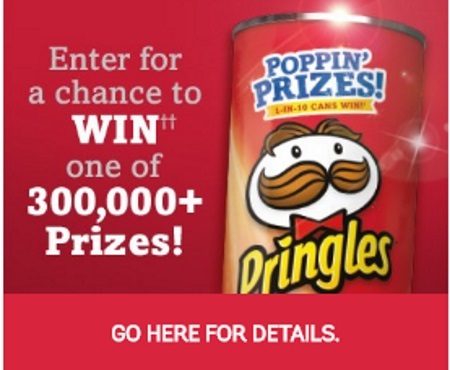 Pringles has a new promotion with Poppin' Prizes! 1 in 10 cans is a winner! There are 301,255 instant win prizes available to be won, consisting of 5 prizes of $10,000 cash; 100 prizes of a Microsoft Surface 3 ($899 each), 300 prizes of a Fujifilm InstaX Bundle ($500 each) and 300,850 free product coupons ($2.50 each). To enter, look for specially marked Pringles Potato chips, find the PIN code on the underside of the foil and enter the Pin code at the link below to see if you've won. Contest closes December 31, 2016.